Please refer to our stock # T1832 when inquiring. This made in USA studio figural hand hammered hand wrought stylized sterling silver owl pendant has two faceted blue green sapphire eyes! The rare blue eyed owl here. 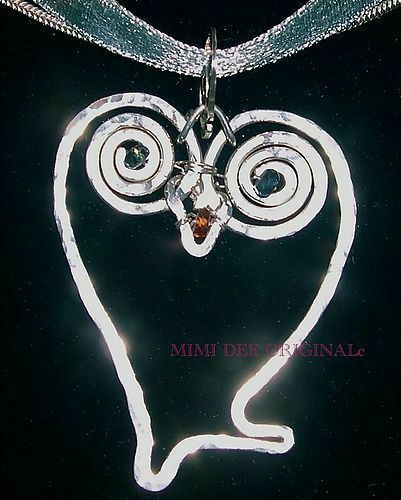 The beak has a padparadscha color sapphire and signed Mimi Dee - Handmade - Sterling Silver. All gems are genuine. Some of my patrons place my hammered metal work in shadow boxes. Total wt: 20 grams of textured semi precious metal including the pre fabricated 20" snake chain. This signed studio metalwork jewelry artist who also paints oils/ acrylics, has made fiber art to wear garments in the past and does not duplicate, has exhibited in various juried shows, more recently since the early 90s and at the previously open Methuen studio store gallery by the same name. A note about precious metal prices and jewelry in general. With metal prices going up, many others use plated metal with their "stones" and ask exorbitant fees for their mass produced product as seen in popular mailed catalogs.